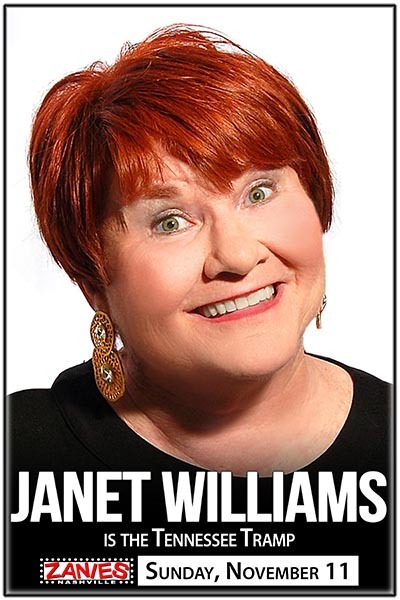 Janet Williams, a.k.a., The Tennessee Tramp is a Nationally touring comedian who plays "A" rooms throughout the United States and Canada. She has done several USO tours including Japan, Korea, Guam, and Germany. She has been a guest on the John Boy and Billy radio show, and does radio throughout the nation. Her audiences consist of folks 18 to 80 as her subject matter encompasses all ages, genders, and ethnic groups. She has an endearing stage presence that makes her audiences think of her as a crazy grandmother, a wacky aunt, or a nutty neighbor. All can relate to her in some way. Besides working the club circuits, Janet does corporate work as well, and has served on the Board of Y-ME in Chattanooga, and has worked their corporate event for three years. She has done comedy for the Erlanger Group for those battling cancer. She has worked fund-raisers for Animal Protection Services both in Chattanooga, and Mississippi. She has been on National Television for two seasons on BET Comic View, and was cast as Trudy Sparks in the Mystic Java sitcom filmed in Chattanooga. She is a lovable force to be reckoned with, and audiences leave her shows feeling she is part of the family.